To mark the one-year anniversary of Pope Francis’s visit to Philadelphia (Sept. 26-27, 2015) for the World Meeting of Families and his stop on campus, Saint Joseph’s Student Senate, Campus Ministry and the student board of SJU’s Alpha Sigma Nu chapter, the honor society of Jesuit colleges and universities, sponsored several commemorative events on Sept. 27. The day featured a special Mass for the Intentions of Pope Francis, held in the Chapel of St. Joseph-Michael J. Smith, S.J., Memorial. 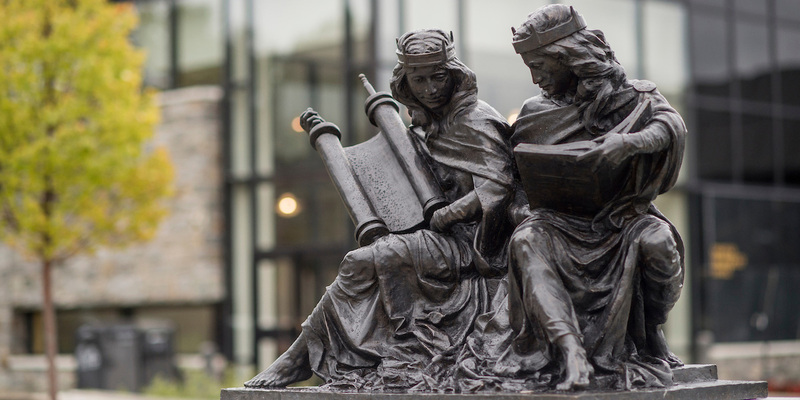 Later, students, faculty and staff gathered on the plaza in front of the Chapel, where the Holy Father blessed the interfaith sculpture “Synagoga and Ecclesia in Our Time,” which portrays today’s Jewish-Catholic relationship of friendship. The bronze sculpture embodies two feminine figures, based on the medieval allegorical figures Synagoga (Synagogue) and Ecclesia (Church). Each holds documents representing their religions: Synagoga, a Torah scroll, and Ecclesia, a Bible. The monument’s dedication last year marked the 50th anniversary of Nostra Aetate, the Declaration on the Relationship of the Church to Non-Christian Religions, which encourages dialogues with all faiths.